Arts for people living with dementia are blooming. David Cutler reviews some notable projects and programmes from dance to singing to theatre. I was fortunate enough on 9th March to attend the premiere of work by three new playwrights at the West Yorkshire Playhouse. What was unusual was that all three have a diagnosis of dementia. I met Rosa Peterson who, with the support of another writer Barney Bardsley, had written a moving short piece called A Horse Called Freedom. Speaking afterwards she wanted to emphasise that her work was about hope, and that was indeed why she had insisted that hope should part of the title of WYP’s pioneering new festival (Every third minute: a festival of theatre, dementia and hope), which we have been privileged to support with the Arts Council England. This landmark event made me think how far and how fast creative ageing with people living with dementia is travelling throughout the UK and beyond. There are many forms of dementia and, of course, everyone with dementia is different. So it is good that there is such a wealth of arts organisations focusing on this area, such as Arts4Dementia, for example, which has concentrated on early stage dementia and people living in the communities and their families. Little of the work funded by the Foundation in our Arts and Older People programme has had a specific focus on people living with dementia. However we have funded a lot of work in care homes and as around 80% of residents will be living with dementia, arts in care homes should always be dementia friendly. There have been many examples, such as our Creative Homes programme which asked arts organisations to link up with care homes with their surrounding communities, our joint funding programme with the Arts Council England (Celebrating Age), and Age Cymru’s cARTrefu which we are supporting with the Arts Council Wales and places artists in residence in care homes. A few years ago I chaired a group of dedicated arts professionals as part of the Prime Minister’s Dementia-Friendly Challenge. The group wrote a Guide to dementia friendly arts venues published by the Alzheimer’s Society. 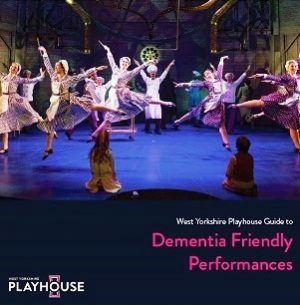 The Guide led on to the publication by the Baring Foundation of a more detailed Guide to Dementia Friendly Performances by Nicky Taylor. 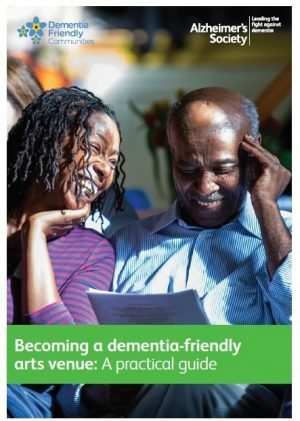 Since then the field of activity has expanded to include a Rethinking Heritage: A guide to help make your site more dementia-friendly and Dementia-friendly screenings: A guide for cinemas, also published by the Alzheimer’s Society. The Life Changes Trust in Scotland has funded a host of creative ageing work for people living with dementia, including work for theatres led by the Edinburgh Festival Theatre. The beneficial health effects may be especially true for singing and music. We have been supporting important work by Live Music Now for an initiative called A Choir in Every Care home. This is just one element of a great wave of interest in music and singing with people living with dementia, such as the long standing Music for Life programme by the Wigmore Hall and performances in care homes by the City of London Sinfonia. It has been estimated that there are around 180 Dementia Choirs in Scotland alone. A programme by the Museum of Modern Arts in New York called Meet Me at MOMA, established in 2007 and carried through over seven years, has done a great deal internationally in raising the attention of galleries and also museums. It has spawned countless programmes. As one example, the always excellent Whitworth Gallery last year ran an exhibition which moved me to tears. It was called Beyond Dementia and was curated by the Fabulous Forgetful Friends. A major programme led by Bangor University with a number of art organisation partners was funded by several of the research councils and produced a large body of evidence and work under the title Dementia and the Imagination. The Baring Foundation and Nominet Trust have been funding City Arts in Nottingham to develop an Armchair Gallery App which will bring a number of world famous collections into care homes. It is based on work begun with Chatsworth House in Derbyshire. We are also pleased to be supporting the Centre for Chinese Contemporary Art in Manchester to explore a programme for isolated older member of the Chinese community. This interest is not confined to the visual or fine arts. We support the Age Friendly Museums Network hosted by the British Museum which can cite examples of dementia-friendly programming in every type of museum in every corner of the country. All art forms have something to offer for people living with dementia and vice versa. The Green Candle Dance Company has been working for some years with people living with dementia, and Ballet Rambert, English National Ballet and Dance Base in Edinburgh among others, are also offering programmes. It is estimated that around 850,000 people in the UK are living with dementia. The Every Three Minute Festival at the West Yorkshire Playhouse has set a new standard for creative ageing for people living with dementia. I am sure there will be many more budding playwrights like Rosa to come.